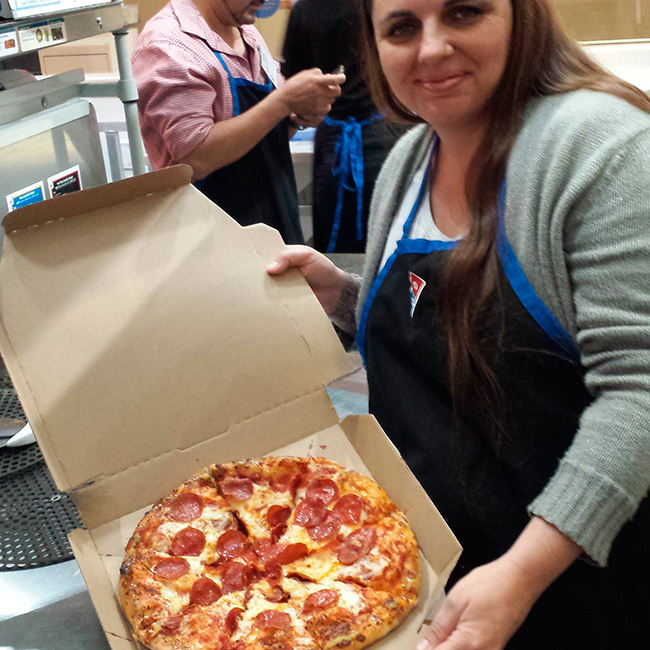 I recently took a trip to Michigan to visit the Domino’s Pizza World Resource Center and their Michigan Supply Chain where I learned a ton about the company and even got to make my own Domino’s Pizza that turned out perfect! 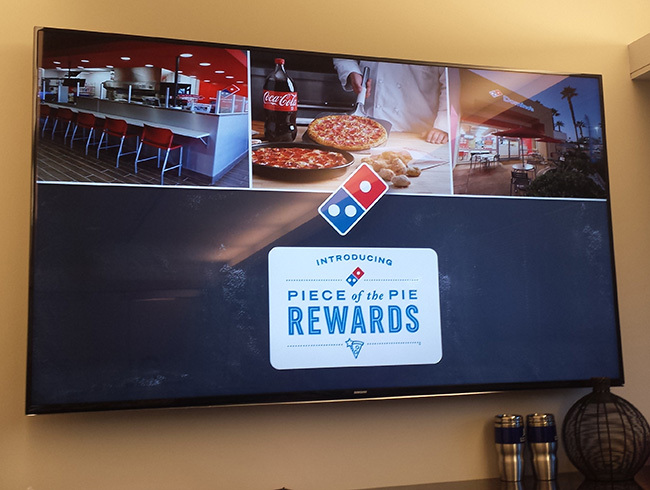 While I was at the Domino’s Pizza World Resource center we learned about their Piece Of The Pie Rewards that is an online rewards system that allows you to earn a free pizza when ordering online. Domino’s Pizza really amazes me when it comes to listening to their customers. They want to know what their customers want and make changes just to make their customers happy. Their loyal customers wanted a rewards system so now when you earn 60 points with the Piece Of The Pie Rewards program you will earn a FREE 2-topping medium pizza. So basically you will earn 10 points per online order that is at least $10. 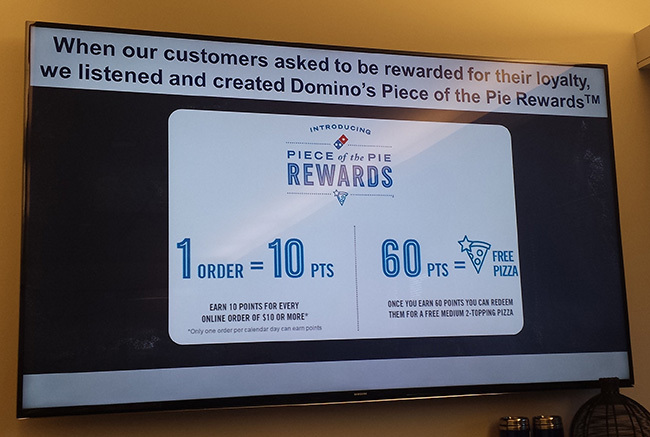 Once you receive 60 points you will earn the free pizza. The only catch with the program is that you can only receive credit for 1 order per day. If you order pizza often this might be a way to earn free dinner a couple times a month! Once I got home from Michigan I couldn’t wait to signup for the Piece Of The Pie Rewards and make my first order towards that free pizza I am looking forward to earning. Signing up for the program and setting up my pizza profile was easy! 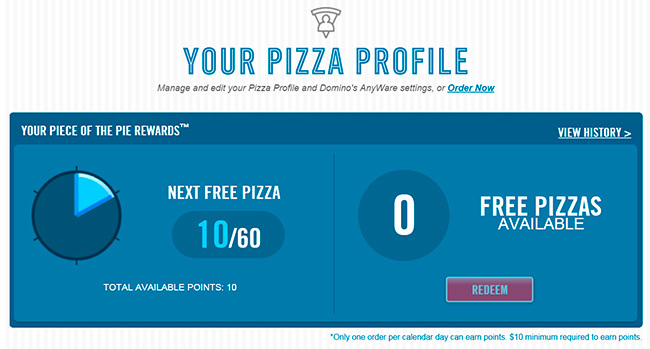 For those tech savvy, once you setup your pizza profile you can order Domino’s Pizza by text message or tweet too! What makes ordering from Domino’s fun is watching their pizza tracker. You can change the theme which the kids really like. My favorite is their tropical theme with the parrot. You will hear music and the bird talking while your pizza is being prepared and ordered.